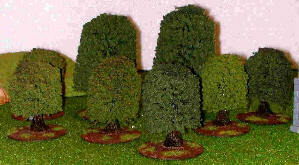 This article is about basing Games Workshop's ready made trees to make them more stable for using in wargames. I didn't like the look of the trunks on the trees, so I gave them a wash of Brown Ink to make them look more like trees. 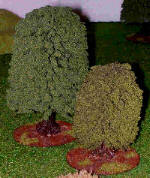 The trees were then glued onto the large flying bases with PVA glue. Modeling sand was then sprinkled around the tree to texture the base. The bases were then painted scorched brown, and drybrushed with bestial brown. Static grass was then added in places to blend it in with the gaming table.